Get Inspired with Your Money. From making it to giving it away, INSPIRED MONEY means making a difference, creating something bigger than oneself, and making the world a better place. This podcast features a lot of inspiring stories from different people of diverse backgrounds. The content is interesting and there's really a lot to learn from this show. Can't wait for more episodes! Really enjoyed listening to this podcast! Took so many things away that I can use to help me now and in the future!! Recently discovered this gem of a podcast.. so well done.. a new favorite! Andy goes into the details of what the interviewee thinks around money and how they grew in their money mindset. It’s helpful to see the different perspectives. Andy does a great job of bringing some great answers & stories out of his guests. I especially enjoyed the Ready Player One episode. Valued learning about how to work with data creatively. So used to thinking of quantitative versus qualitative, instead now thinking about how to marry the two! Thinking about customer data bases very differently. Thanks! Andy does a great job helping YOU the listener. He wants YOU to develop, be a better person and live a richer life. Join Andy on your own personal journey to a life that you're proud of. So grateful that Andy is out there doing what he's doing! A beautifully produced, informative, and inspirational show. Andy is such a calm, reliable presence and great interviewer. Loved the tone of this show and actually something I have gained a growing interest in lately. Listened to the one with Lalvani in full and appreciated how you let the guest control the pace and shine. Good work! A Positive Outlook on Money! I really appreciate this show because it’s showing you what great people are doing with their money. It’s not telling you specifically what you’re doing wrong, but rather shares stories of people doing it right and how they achieved success. I found it very insightful and bonus points for the interview with Zak Penn! Super cool to hear about his experience. Subscribed and can’t wait to hear more! Andy is an excellent host and the show was extremely inspirational. Really shined a light on things I've been doing wrong with my money (specifically withdrawing too much without really thinking about the money). Highly recommended for anyone hoping to save. I think I found my new favorite podcast…loved the episode about The Financial Gym, sharing simple practical tips and ideas. Excellent work! Inspiring! Ready for my life in the front row and ready to make the most of every moment! Can’t wait for more! This is a really inspiring podcast! Andy has a great speaking voice and picks the best guests to interview. Episode 34 was the best! The best take away from the episode is when you don’t live a life that doesn’t align with your happiness, you spend money trying to be happy. Such a moving tip and brought me to my own realization. I really liked the money tip and wished I heard this episode before I cashed out one of my retirement accounts. Keep inspiring others! Great show! Andy has great guest that has inspiring stories that I believe everyone can relate to. The episode with Zak Penn was a good lesson on having to go through the ups and downs, dealing with rejection and learning how to perfect your craft. I was really drawn to how Zak referenced putting in his 10,000 hours early in his career. Very inspiring stuff. This show is about so much more than money — it's about how to live a fulfilling life and not let money in your way. I loved the episode, “Pursuit of a Purpose Driven Life.” The guest was so inspiring, and I enjoyed hearing about her career path. The show is really well-produced, and I'm excited to hear more. If there's one thing I look for in a finance related show is professionalism. This show accomplishes that and much more. Host Andy Wang has an excellent way of pulling practical information from his awesome portfolio of guests. I landed on his interview with John Lee Dumas because I too am a podcaster and although I wish it could have gone on longer, within less than half an hour, my mind was changed on how to go about making money with my show as well as how I handle my personal finances. Looking forward to listening to more! Listened to the John Lee Dumas episode which was super useful for me because I eventually want to be able to interview him on my show and I have started his podcast course! The name of this podcast really hits the nail on the head. I love the mix of guests’ inspirational stories as to how they used wealth to live a more purposeful life combined with everyday useful money tips. This podcast is perfect for someone that is interested in not only their own financial growth, but also someone that is interested learning from others how to use that growth to do good. Just started on this show with episode 1, not because I am big on chronology but because I love Weird Al! So cool to hear from his guitarist. Can't believe he is self taught! This show sets itself apart from other money podcasts in that it isn't just about getting rich but about making a difference with money. This is the most wholesome wealth show ever, I recommend it! I really enjoyed Andy's interviewing style. He was so respectful and curious about his guests and their stories. I tuned into episode 34 with Tope Fajingbesi and I loved her story about living life with purpose, after strating out with a more traditional job. I subscribed and will tune in again! Inspired money is not only a informative and eye opening podcast but it’s also very thought provoking. The Art of Moment Making episode made me think about my front row and what front rows I may be in. I’ve subscribed and I would definitely recommend anyone reading this do the same. Technology meets mindset in this inspiring show! Fascinating mix of money mindset training along with technological advances we should all understand like Bitcoin and AI. Andy is a great host who brings in perspective-shifting guests! I enjoy listening to someone who believes is using money to make the world a better place! “Whats your earliest childhood memory of money?” is a great question to open with because truly our money mindset is formed dusing childhood. Truly enjoyed Jen Hemphill's ep and will definitely be buying her book! Inspired Money definitely inspires! This podcast is amazing! There are so many things that I’m changing when it comes to my financial goals, particularly mindset. If you are looking to have guidance in getting things together with actionable steps, you need to subscribe!! Recently started listening to this podcast. It's good! I was actually surprised to like it, because most business-type podcasts or radio shows usually put me to sleep. But, this one sounded different, so I decided to check it out. And I'm glad I did. Definitely give it a listen. I promise: Even if you hate business oriented podcasts, you WILL like this one. You will not be let down! This is a wonderful podcast! Andy always gets interesting guests, who offer great perspectives and tips on how to lead a purposeful life. His straightforward and practical questions draw out key insights. I always feel grateful after listening to an episode, because I learn things and gain inspiration to keep pursuing my goals and dreams! It was such a pleasure to be featured on Inspired Money! It’s a great program! Well done Andy! This show has been super helpful to me in planning my financial future…. Beyond Amazing! A MUST Listen! I’ve been listening to this podcast series for awhile before writing this review. Every episode is simply AMAZING! Andy has the ability to extract so many great nuggets of inspiration that I end each episode feeling more inspired and motivated! Most people I know lead very busy lives but taking time out to hear some great content on the subject of money is truly like giving yourself a gift every week! And who doesn’t enjoy a great gift? Thanks Andy for offering the world a wonderful series! Best hour ever!!! Great job!!! I was sort of interested in listening to your podcast, but I thought I had nothing to do with investment. Your kids have grown beautifully and inspired me today. I want to learn to donate and invest, and teach my daughter as well. Thanks for helping to change our perceptions about money through inspiring stories! Andy Wang is a smart and engaging host. Makes the conversation run smoothly while also giving good insight. Keep it up! Andy does an amazing job of producing quality, engaging, and innovative episodes. He pulls out insightful nuggests that create actionable advice. Listen now! Love the variety of guests! This is a great podcast! I really appreciate hearing from a variety of diverse guests! I’ve listened to other podcasts that touch on the subject of money, and with those I often feel like it’s a list of all the things I’m not doing right. With Inspired Money, that is not the case and it is actually inspiring to listen to the journeys shared! Very nice job Andy! I like your concept for this podcast and enjoyed the first episode very much. Nice broadcasting voice too- way to go! I'm looking forward to the next ones. Love this new podcast. Inspiring stories! Looking forward to more episodes. I like the positive way of looking at money and enjoy hearing different people's experiences. Highly recommended. Hey inspired money maker, do something that scares you. Do something that's going to make you better. Do something to give back in a bigger way to the world. Tell me your INSPIRED MONEY story. I'm excited about this podcast and can't wait to hear from you. Andy's guests are really interesting. Its obvious that Andy does a lot of research and gets his guests engaged and talking. Some very cool stories here and well worth subscribing. I recently subscribed to this podcast and enjoy the interviews. It's about money. And so much more. I wonder, to vary the format, if some episodes might tackle specific money questions? Welcome to Inspired Money with Andy Wang. Amy Jo Martin, NY Times Best-Selling Author and host of Why Not Now? 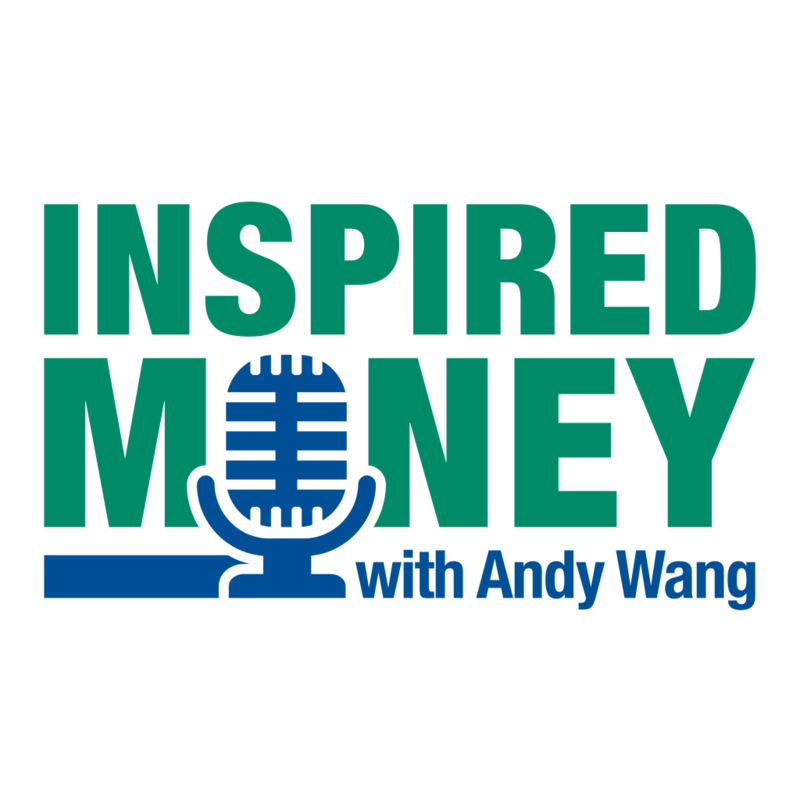 The best way to listen to Inspired Money is to subscribe (it's FREE! ), and you’ll get the latest episode every week. Listen to our complete catalog here or on any podcast app. Inspired Money is available wherever you listen to podcasts. Ask Alexa! Have a question? Or have a favorite place where you listen but can't find Inspired Money? Contact us and let us know. Thanks for your support! How you can help. Tell your family and friends about your favorite Inspired Money episode. Join our Facebook community to keep up-to-date and get a peek behind the scenes. Subscribe, rate, and review us at Apple Podcasts or wherever you listen.